A 1960 Jacques Chocolat French card #619, with a numbering sequence starting at #601 and running through #624. This 24 paper thin card set was inserted into bars of chocolate and feature a variety of ships, from old to modern. Cards are frequently found with stains or glue on back from being placed in a scrapbook. A different 1960's issue Jacques Chocolat French card. As with the card above, this to is very thin for placement in a scrapbook. It is card #95 and with very attractive and colorful artwork. 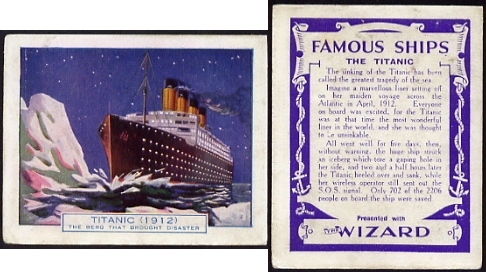 A 1931 Titanic card from the Famous Ship series was made/presented by "The Wizard". The front features a very colorful picture while the back gives a short story about the ships demise. This scarce card was hand-cut from a 1961 Quaker Oats cereal box. Several series of cards depicting various events were placed on the boxes. The Famous Ship series consisted of a 12 card set.